SUBHEAD: We must stop emitting gases such as carbon dioxide and methane, as fast as possible. Image above: Methane gas blasts one of many large crater-like holes through melting Siberian tundra in 2017. 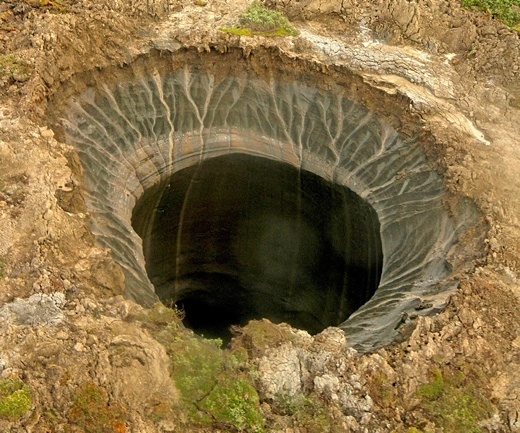 From (https://www.livescience.com/59705-oozing-methane-blasts-craters-in-siberian-tundra.html). The Earth is already too hot: we are in danger now, not just in the future. Warming will accelerate, and 1.5°C is only a decade away, yet annual emissions are still growing and the current, post-Paris emissions trajectory will result in catastrophic warming. The Great Barrier Reef and other coral systems are dying. We are greatly exceeding Earth’s limits, and food and water shortages are contributing to conflicts and forced migration. On current trends, following the Paris Agreement, we may face catastrophic warming within our children’s lifetimes, with large parts of the world uninhabitable and major food growing regions ruined by drought (such as Australia’s Murray-Darling Basin, south-western USA) or rising seas (such as Vietnam, Bangladesh, Egypt). In past periods when greenhouse levels were similar to the current level, temperatures were 3–6°C higher and sea levels around 25–40 metres higher than in 1900. Many people have experienced emergencies such as fires, floods or cyclones. In these times, we move into emergency mode. In emergency mode we stop “business-as-usual” because nothing else matters as much as the crisis. We don't rush thoughtlessly in, but focus on a plan of action, which we implement with thought, and all possible care and speed, to protect others and get to safety. Everyone chips in, with all hands on deck. Climate warming is now a planetary crisis or emergency, requiring courageous leadership and a coordinated society-wide response of a scale and speed never before seen in peacetime. And change can happen fast when we really apply our effort: from fighting natural emergencies and rebuilding cities, to going to the moon or building a digital economy. The steps to a safe climate will also build a better and more livable world: clean energy, better-designed cities, comfortable homes, healthier food, less waste, regenerative farming and the recovery of the natural world. Framing. Research on public health promotion campaigns shows that the messages that work best combine a personally relevant description of the threat (fear), a clear exposition of the solution with a clear path of achievable actions to address it (hope). Counterposing “fear” and “hope” narratives is a false dichotomy, because both are needed. Just reading a climate message that forthrightly describes the seriousness of our situation can increase commitment to taking action. Strong fear messages have been found to be more effective than weak fear messages. It can activate and reinforce values of empathy, responsibility, protection, community, fairness and opportunity, These world views are commonly held by both conservatives and progressives . The “health, wellbeing and livelihood” frame is an opportunity to spell out not just the centrality of the climate change threat, but how it impacts and threatens each and every part of our lives, including where we live, jobs, transport, energy infrastructure, the economy and even where we holiday.